Chrysalis Ruby Crystal Expandable Bangle. Ruby symbolizes integrity, devotion and sincerity. It is said to have the ability to bring harmony and passion into your life. 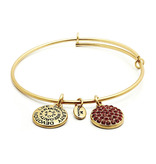 Standard = 7 to 8.5 inches Finish:14k Gold Plate Birthstone: - July Crystals: 37 Ruby Swarovski Crystals Text Sincerity, Devotion, Life, Harmony, Integrity, Passion Your adjustable bangle will come packaged in a Chrysalis suedette pouch. Stack them up for maximum effect ! !